You're invited to join the Ms. Foundation for Women for a special advanced screening of the film Hidden Figures. 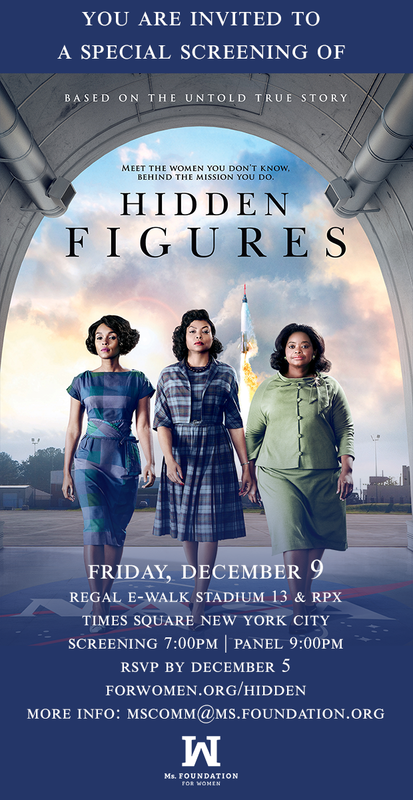 "Hidden Figures" is based on the lives of Katherine Johnson (Taraji P. Henson), Dorothy Vaughan (Octavia Spencer), and Mary Jackson (Janelle Monáe) - three incredible women of color whose contributions helped send Americans to space. "Hidden Figures" is based on the award-winning book by Margot Lee Shetterly, whose research uncovered the women talent - scientists, mathematicians, and programmers - behind the space program. Seating for this screening is limited: you must RSVP by December 5 to attend.